As the Music Library in Grand is celebrating its 40th anniversary this year, we are delighted to be commemorating one of Ireland’s most influential and fondly regarded musicians, the peerless guitarist Rory Gallagher. Indeed, the Music Library was renamed the Rory Gallagher Music Library in 2005 and this summer as part of the Remember Rory programme organised by the library there is an exhibition of a select few of Rory’s guitars and memorabilia such as concert posters that were kindly provided by his brother Donal. An interesting aspect of the exhibition is a collection of Rory’s favourite crime novels. Many fans may be unaware that he was an avid reader of crime fiction and gained much inspiration from the genre which is reflected in aspects of his music, namely the song Continental Op after the Dashiell Hammett novel. Other favourite authors include Patricia Highsmith (The Talented Mr. Ripley; Strangers on a Train), Raymond Chandler (The Big Sleep; The Long Goodbye), Ian Fleming (Casino Royale; Thunderball), Eric Ambler (Journey into Fear; Epitaph for a Spy) and many others. Ian Rankin himself praised the wonderful mural by John Coughlan that was recently erected outside the library in a tweet as seen here. The exhibition of memorabilia will run until the end of August and there will be more talks and performances throughout the rest of the year. A couple of weeks ago we were delighted to have Cork’s own, Discorde Quartet, performing in the City Library as part of an event to commemorate the centenary of the birth of poet, Seán Ó Riordáin. They played a beautiful selection of Irish airs & melodies to a captivated audience and made a wonderful accompaniment to the Irish language poetry readings from Peann agus Pár. We captured the performance on video and we thought it might be nice to share it with you. Kate’s trip down Memory Lane! Kate Lehane is a fourteen year old from Cork who isn’t obsessed with One Direction or 5 Seconds of Summer but would rather spend her time listening to Frank Sinatra or Elvis Presley! Kate feels that something is missing from modern music that can only be found in the great songs by the legends of the past. She also believes in the power of music as a unifying force and as a means of bridging the gap between the generations. Kate comes from a family who have long been involved in Cork musical circles. Her late great grand-uncle, Tadhg O’Driscoll, was a well known and well loved character who worked tirelessly in the promotion of ‘Gramophone Circles’ in the city. 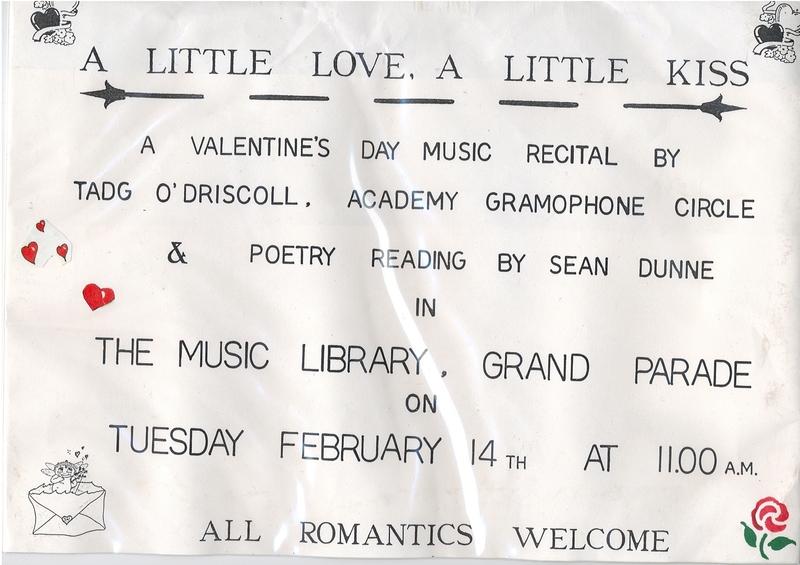 A flyer from 2008 for one of Tadhg O’Driscoll’s recitals in Cork City Library. 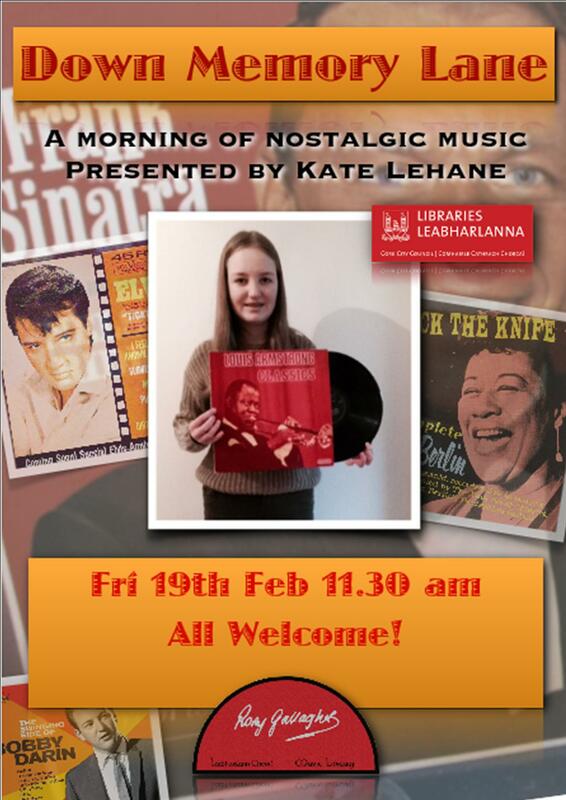 Kate will present a selection of her favourite music in the Rory Gallagher Music Library on Friday, 19th February at 11.30 am. All are welcome! In the spirit of all things nostalgic, Kate will present her musical selection on vinyl, rather than CD. In an era where digital streaming ‘on the go’ seems to be the accepted norm for musical consumption, it’s refreshing to find someone so young who is encouraging us to sit back and take the time to enjoy music as it should be enjoyed. Posted on February 13, 2016 February 13, 2016 Categories Cork Music News, Cork Music Social Aspects, Music NewsTags cork city libraries, Gramophone Recitals Cork, Music Events Cork, Nostalgic Music, Rory Gallagher Music Library1 Comment on Kate’s trip down Memory Lane!